In the first game of the 2019 preseason, Metro beat IF Elfsborg 2:1. The Swedes' Pawel Cibicki opened the scoring from the spot early in the second half. 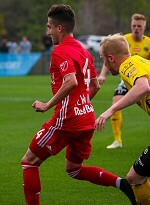 RBNY responded with two goals by Daniel Royer, the second also a penalty. Metro used a mixed lineup of regulars and up-and-comers, making wholesale changes throughout the game. Alejandro Romero Gamarra, subject of transfer gossip, played the first 30 minutes.